Celebrity fragrances, or ‘Celebuscents’ as they are often affectionately referred to, have grown significantly in popularity over the last 10 years or so and it seems that anyone who’s anyone is willing to put their name to a fragrance regardless of fame, talent or taste. Every pop star, actor, actress, reality TV star and model (anyone who is anyone basically) is cashing in on the trend and not all are successful in creating something that represents their persona or perhaps more importantly – smells good. So, with the huge plethora of celebuscents on the market, how do you the separate the good from the bad? As always you should trust your nose, smelling is believing as they (or I) say, but to get you started I have compiled a guide to some of my favourite celebrity fragrances, a list that frankly ranges from the sublime to the ridiculous. When one thinks of celebrity fragrances there is only one fragrance that comes instantly to mind – White Diamonds by Elizabeth Taylor. Released in 1991 White Diamonds, with its soapy floral bouquet, was the first celebrity perfume to be a true, worldwide success and is often regarded as the mother of the modern day celebrity fronted fragrance. The recent onslaught of celebuscents however, can be attributed to J Lo’s debut fragrance Glow, which was so successful upon its release in 2002 that just about every other celebrity on the planet felt the need to get in on the act. Glow is in fact a rather unassuming scent, smelling of sharp, hissy roses accented by steamy musks to give the impression of shower-fresh skin. It isn’t a fragrance that breaks barriers in terms of originality but it is rather nicely done and would suit those that want to smell pretty and clean without being particularly showy. Jennifer Lopez has released a number of fragrances following the success of Glow, some as entirely scents new and some as flankers of the original. This writer’s nose is quite partial to the flirtatious fruity-vanilla of Live and the beachy, sun kissed vibes of Miami Glow. What separates Sarah Jessica Parker from other celebrities is a genuine love of perfumery. Having been reputed to wear her own homemade blend of Bonne Belle Skin Musk, Egyptian Oil and Comme des Garçons Avignon (think church incense) for many years  Parker developed her first perfume ‘Lovely’ with an unusually hands-on approach. The result is a smooth floral with the texture of pink chiffon and a surprisingly deep, earthy base of patchouli & musk. The tension between the pink softness of flowers and darkness of woods creates something that straddles the lines between feminine & masculine, giving the impression of a soft androgyny that feels surprisingly comfortable. The best celebuscents are those that smell just like the celebrity they are supposed to represent and no celebrity fragrance achieves this more perfectly than Fantasy by Britney Spears. Released at a more innocent time when shaved heads and umbrella assaults were a mere spot on Ms. Spears’ most distant horizon, Fantasy is a fruity floral that evokes the über girly smells of cupcakes and Barbie dolls. What could be more fitting for a bubble gum pop princess? Madonna – the trendsetter, the provocateur and the mother of reinvention was surprisingly late to the Celebuscent party, only releasing her premiere perfume ‘Truth or Dare’ last year. Just like Sarah Jessica Parker, Madonna has a well-known passion for all things fragrant, with her tastes firmly set in the camp of vampish florals. Reputed to wear the tuberose H-Bomb that is Robert Piguet’s Fracas, Madonna’s Truth or Dare really serves as a modern remix of her most adored scent. Taking the sweet, narcotic floral heart (tuberose, jasmine and gardenia) of Fracas and adding a metric ton of vanilla, fuzzy benzoin, marshmallow and musk, Truth or Dare is more delicious than it is dangerous, but it is definitely a worthy contender for one of the better made celebuscents on the market. 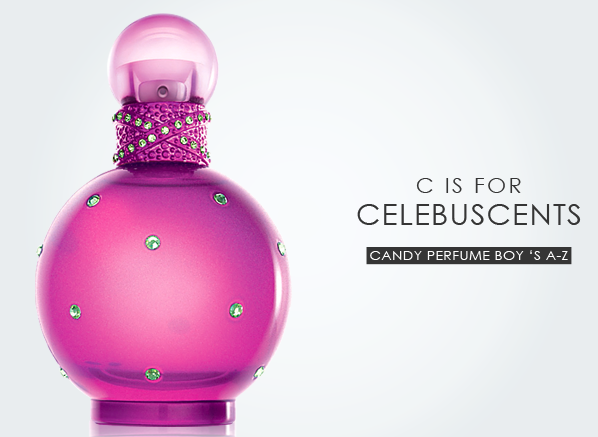 Not all purveyors of celebuscents are as obvious as J Lo, Britney or Madonna. In fact, the naughty noses over at Etat Libre d’Orange have picked perhaps two of the least likely candidates for their celebrity offerings. Their first muse was the Picasso-esque Spanish actress Rossy de Palma (famous for starring in many a Pedro Almodóvar movie) for their rose based ‘Eau de Protection’. Taking inspiration from Rossy’s unique looks, Eau de Protection is a blood red rose contrasted by sharp, sour and metallic notes to conjure up the image of a twisted beauty – deadly yet irresistible. Ethereal Scottish actress and famous ginger Tilda Swinton served as the inspiration for Etat Libre d’Orange’s second celebuscent ‘Like This’. Swinton worked in collaboration with perfumer Mathilde Bijaoui to create a fragrance that is reminiscent of home with varying orange hues of ginger, pumpkin, immortelle and rose. Tilda’s fragrance is warm, cosy, delicious and effortlessly wearable and can easily be considered as one of the greats, not just of the celebuscent genre, but also of perfumery as a whole. In keeping with the two actresses that inspire the Etat Libre d’Orange celebuscents both fragrances are unique, surprising and extraordinarily well crafted. Whether you feel that you are ready to try something that little bit different, or whether you just adore Rossy and Tilda, these scents are not to be missed. What are your favourite celebuscents? Perfume is of course entirely subjective, meaning that one man’s trash can very often be another person’s most favourite perfume in the whole wide world, so I’d like to hear what your favourite celebuscents are. Tell me, are you bonkers for Britney or do you go goo-goo for Gaga? I tried this as part of the taster set from Etat Libre d'Orange and this was my favourite. It transports me to faraway lands where it's Christmas every day and the world is full of gingerbread houses! A lovely light yet deep & complex scent-starts off with a very 'orange' scent, reminiscent of Tilda Swinton's hair! Then dries down to a lovely soft, sweet musky scent with cloves, cinnamon, black pepper & pumpkin. I can't wait until it's winter again so I can wear it. If you love gourmand scents you'll love this. This entry was posted on Monday, February 25th, 2013 at 11:03 am and is filed under Candy Perfume Boy, Fragrance, Guest bloggers. You can follow any responses to this entry through the RSS 2.0 feed. You can skip to the end and leave a response. Pinging is currently not allowed.